Galileo's Middle Finger - Greatness For The Ages - Motivate Amaze Be GREAT: The Motivation and Inspiration for Self-Improvement you need! Imagine that you lived in the seventeenth century, in a world that favored planet earth has the center of the universe (geocentricism) and some "lunatics" chased by the Church where saying that the sun was the center not the earth (they defended Copernicus theory). Until one day, an astronomer improved an astrological instrument called the telescope and was able to see things outside planet earth that others couldn't at the time. One of his conclusions was that in fact the sun is the center of the solar system and the earth and other planets revolve around it (heliocentricism). Well this sums up the controversy about a famous Italian mathematician, astronomer, philosopher and physicist called Galileo Galilei. His life was marked by criticism around his achievements and studies. Galileo Galilei accomplishments culminated with him being tried in 1615 by the Inquisition and found suspect of heresy, the sentence was house arrest for the remainder of his life. 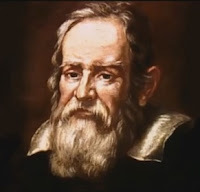 Today we all take for granted that the sun is the center of the solar system, Galileo is regarded has the "Father of Modern Science", the Catholic Church issued declarations acknowledging the errors committed towards Galileo's sentence, and Galileo has it's own museum "The Museo Galileo". Done deal he personified what greatness is all about. The middle finger from the right hand of Galileo Galilei. 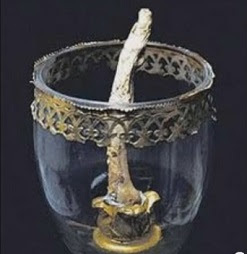 It was removed from Galileo's body when its remains were transported to a new burial area in 1737. Nequidquam superas sonata ascendere in arces." reach where neither Enceladus nor Tiphaeus ever reached." So, the finger symbolizes Galileo pointing to the skies, pointing to evolution, to new things, to the infinite, pointing to the direction of the space age where NASA took off. Because simply this men was a visionary, way ahead of his time. Galileo Galilei discoveries were timeless. His discoveries and courage cost them his life. How many of us are ready to do make this types of choices? Most people would go against what they believed in, in order to have freedom, not Galileo! A question remains, why the middle finger and not the index finger? There's no official explanation to it, it's anyone's guess. The question is legit, because when you point at something you use the index not the middle, the index finger is also known as the pointer finger by a reason. Extending the middle finger in most societies is considered to be offensive and obscene, how does this fits to today's story? "And yet it still moves!"